Open: everyday 24hrs, Friday closed in the afternoon and Saturday open at night. 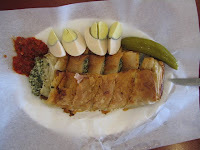 Burekas Amikam sells Burekas - That is, phyllo dough pastry puffs stuffed with cheese, potato and vegetables, served with pickled cucumber, hard boiled egg and a spicy sauce. The result is just delicious and eating it is a complete relish (we recommend on the cheese and spinach one). New burekas are baked all the time, that's why sometimes you have to wait a bit. But it's definitely worth the wait. It is a great mid-day snack, or after a night of clubbing and drinking (as Israelis clubbers do). It's next to corner of Iben Gvirol by Dizengoff. 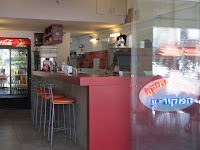 You can go up on Dizengoff (with your back to the Dizengoff square) and then go down till you get to Iben Gvirol. Go couple of meters to the right and you are there.